In my 16 years of full-time pro-life work I have met some of the most incredible people around the world. For all the criticism abortion supporters have about the pro-life movement, portraying pro-lifers as having no concern for the less fortunate, as not caring about children after birth, as being mean-spirited, etc., I have encountered a movement of people that is the exact opposite. I have met pro-lifers who have adopted children domestically and internationally. I have met pro-lifers who have adopted not one but several children, including sibling sets all at once. I have met pro-lifers who fostered children who otherwise had no place to go. I have met pro-lifers who have welcomed pregnant women into their homes. I have met pro-lifers who have adopted and/or birthed children with special needs and embraced these lives as pure gift. I have seen that same phenomena in how some abortion supporters represent pro-lifers--seeing the pro-lifer not as he or she actually is, but as a figment of the abortion supporter's imagination. Why is that? Perhaps it's because when you're wrong about something and don't want to admit it, that by demonizing those who hold the opposite perspective, you can feel justified in maintaining your false views. Perhaps it’s also because when someone is in darkness they close their eyes at light, and that prevents them from seeing things as they are. "What comes to mind as I'm hearing you speak is that when someone is in darkness, your light is blinding. When someone is in darkness your light—and you have light—is blinding. If this room was pitch-black dark and I flicked on movie-studio, high-beam lights, what would you do? You'd say 'Ouch, that hurts, shut it off' or you'd close your eyes. But eventually what happens when we wake up in the morning and we kind-of experience that with our bathroom light? Our eyes adjust, right? So there will be that initial reaction of rejection, but ultimate adjustment. And I would say when someone says, 'I would have aborted that child' it's very possible what they're non-verbally saying to you is, 'I did abort that child and how dare you remind me of what I did.' Because your light hurts in their darkness. "And so what I recommend is that we never take this hostility personally, that we pray for these people and we sit in their pain by allowing them to tell us their stories without any agenda to try to convince them of anything… [So when] you're ever in a situation where someone says, 'I would abort' …ask open-ended questions like, 'Why is that?' or 'What would scare you most?' or 'Do you know anyone who's aborted in this type of situation and what has that experience been?' And just let the story be told. And what they will remember is your light and how you reacted to their darkness, with gentleness and with compassion—and that will draw them out to where you are." If you've wondered how to speak clearly and compassionately about euthanasia and assisted suicide, this new apologetics presentation above will help! Thanks to Victor Panlilio for filming and putting together this recording. Note: You can also read an FAQ on the topic by clicking here. This is a must-watch video about the meaning of love. As Daniel Vander Woude says in it, "We've come to understand Christ's sacrifice even moreso because of Dad's sacrifice for Joseph." 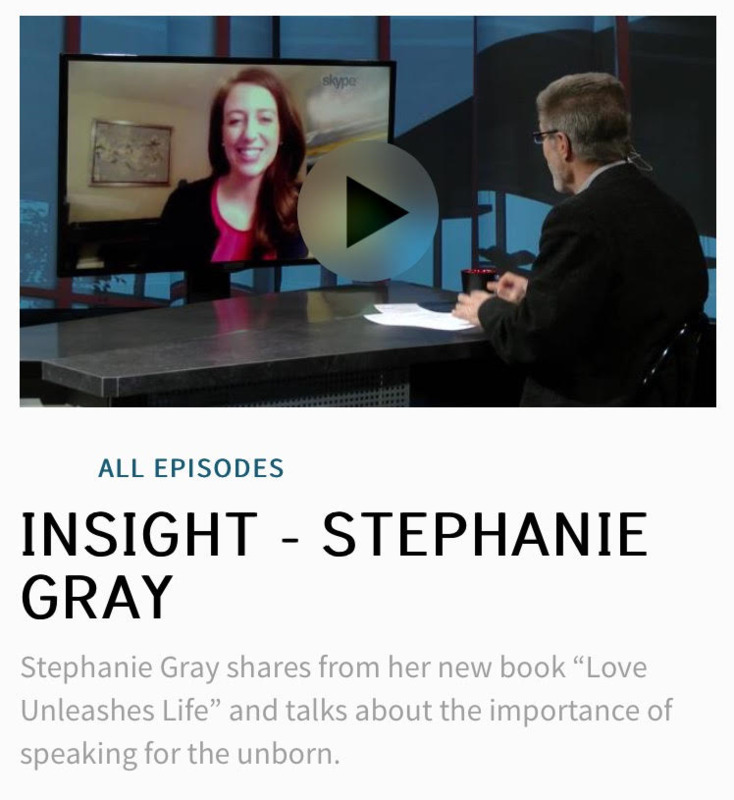 On December 14, 2015, Paul Arthur, host of the Miracle Channel's Insight, interviewed Stephanie about her ministry and her new book Love Unleashes Life: Abortion and the Art of Communicating Truth. You can watch the full interview online here. "We could say that suffering . . . is present in order to unleash love in the human person, that unselfish gift of one’s 'I' on behalf of other people, especially those who suffer. The world of human suffering unceasingly calls for, so to speak, another world: the world of human love; and in a certain sense man owes to suffering that unselfish love that stirs in his heart and actions." The wonderful Victor Panlilio kindly recorded my presentation, and this (above) is a one and a half minute clip he put together.